A very rare yellow color form of L. nanum, it, as well, is a difficult subject in the garden. As with nanum which seems to flourish in Scottish gardens, winter rot from wet soils usually will do it in. This lily was at one time classified as Nomocharis and has also been known as Lilium euxanthum. Our title photo showing 'Lilium nanum var. flavidum' in its natural habitat was taken by Mr. Sonam Wangchen who operates 'Bhutan Excursions. 'Bhutan Excursions and can be reached at www.bhutantour.bt for those wishing to see this rare and delicate beauty in person. What Mr. Wangchen and his tours members see in person is that of which most of us can only dream. Photo copyright Mr. Sonam Wangchen, Bhutan Excursions, all rights reserved. Used with permission. Insert photo #1 copyright Pontus Wallsten of Switzerland. Used with permission. 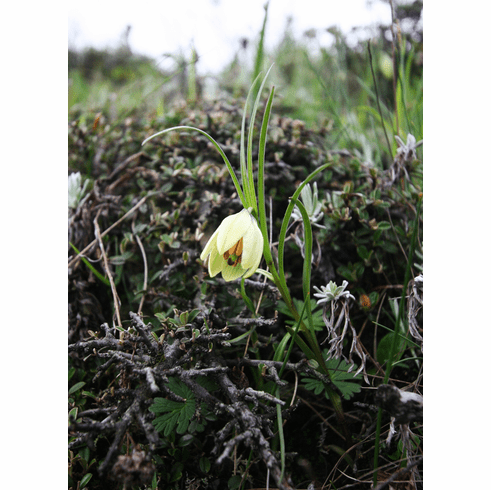 Pontus has an excellent book titled 'The Lily Species and their bulbs' and he can be contacted by email at pontus.wallsten@bluewin.ch for more information. He also offers some rare species lilies in limited quantities that are shipped from his nursery in Switzerland. Photo insert #2 is of 'Lilium nanum var. flavidum' in its natural habitat near Tibet was taken by Yijia Wang. Copyright Yijia Wang, all rights reserved. Used with permission. Yijia does offer seed of several Chinese Alpines at his nursery as www.canursery.com along with seed of other alpine natives of China.